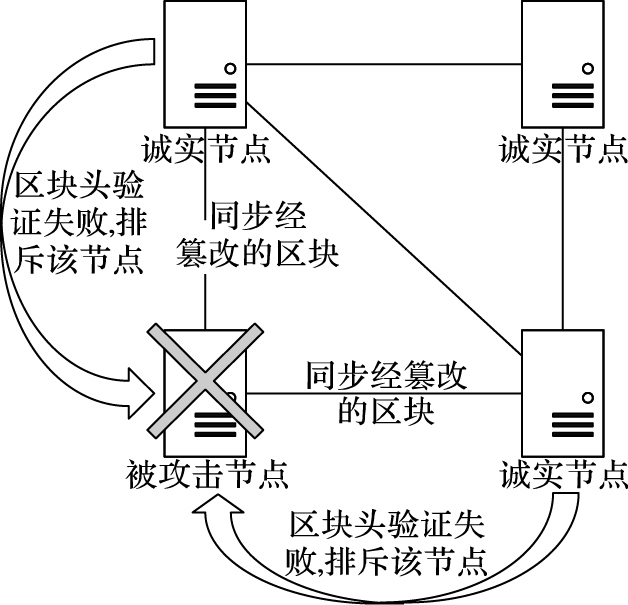 李悦, 黄俊钦, 王瑞锦. 基于区块链的数字作品DCI管控模型[J]. 计算机应用, 2017, 37(11): 3281-3287.DOI: 10.11772/j.issn.1001-9081.2017.11.3281. LI Yue, HUANG Junqin, WANG Ruijin. DCI control model of digital works based on blockchain[J]. Journal of Computer Applications, 2017, 37(11): 3281-3287. DOI: 10.11772/j.issn.1001-9081.2017.11.3281. Abstract: In order to solve the problems of copyright registration, rampant piracy and copyright disputes faced by digital intellectual property under Internet ecology, a Digital Copyright Identifier (DCI) control model of digital works without trusted third party was proposed. 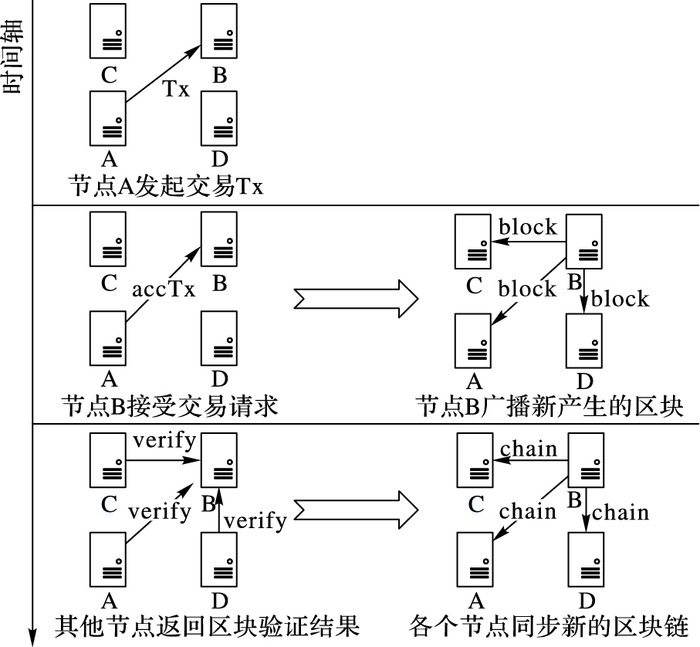 Firstly, the Peer-to-Peer (P2P) architecture based on the concept of de-centralization of blockchain was constructed. The blockchain replaced the traditional database as the core of storage mechanism. Through the creation of transactions, construction of blocks, legitimacy validation and link of blocks a digital work blockchain transaction information storage structure was built, guaranteeing the copyright information not be tampered and traceable. Secondly, the digital distribution protocol based on smart contract was proposed, three types of contracts include copyright registration, inquiry and transfer were designed, and the transactions were generated by automatically executing the preset instructions to ensure the transparency and high efficiency of models. 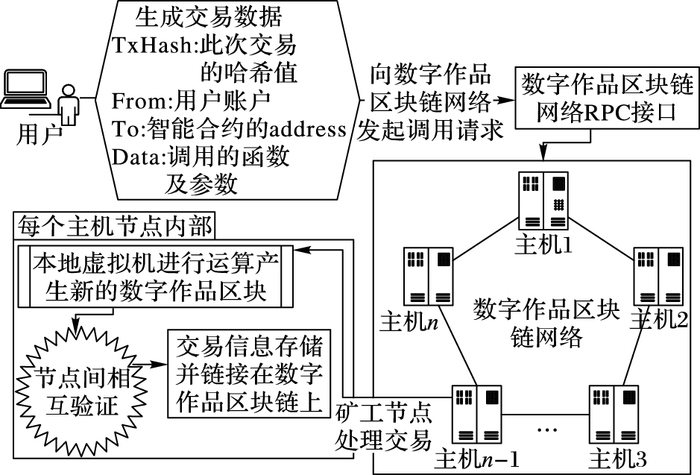 Theoretical analysis and simulation show that the probability of forged block attack is close to zero in the digital work blockchain network, compared with the traditional copyright authentication mechanism based on trusted third party, the model has better architectural security. The experimental results show that the model simplifies the threshold of digital copyright registration, enhances the authority of copyright certification and has better real-time and robustness. BLESSING L T M, CHAKRABARTI A. DRM, a Design Research Methodology[M]. London: Springer, 2009: 4-10. 游福成, 郑良斌, 曾广平. 基于数字水印与移动Agent的数字版权保护系统设计[J]. 中南大学学报(自然科学版), 2007, 38(S1): 1087-1091. GRINBERG R. Bitcoin:an innovative alternative digital currency[EB/OL].[2017-03-01]. http://www.bitcointrading.com/pdf/bitcoinbyreubengrinberg.pdf. SASSON E B, CHIESA A, GARMAN C, et al. Zerocash:decentralized anonymous payments from bitcoin[C]//Proceedings of the 2014 IEEE Symposium on Security & Privacy. Piscataway, NJ:IEEE, 2014:459-474. SWAN M. Blockchain:Blueprint for a New Economy[M]. Sebastopol: O'Reilly Media, Inc., 2015: 20-37. PREE W. Blockchain:technology and applications[EB/OL].[2017-03-02]. http://docplayer.net/42277669-Blockchain-technology-and-applications.html. NORTA A. Creation of smart-contracting collaborations for decentralized autonomous organizations[C]//Proceedings of the 14th International Conference on Business Informatics Research. Berlin:Springer International Publishing, 2015:3-17. GARAY J A. Blockchain-based consensus[C]//Proceedings of the 19th International Conference on Principles of Distributed Systems. Dagstuhl:Schloss Dagstuhl-Leibniz-Zentrum fuer Informatik, 2016:2-4. SZABO N. Formalizing and securing relationships on public networks[EB/OL].[2016-11-20].http://journals.uic.edu/ojs/index.php/fm/article/view/548/469. KOSBA A, MILLER A, SHI E, et al. Hawk:the blockchain model of cryptography and privacy-preserving smart contracts[C]//Proceedings of the 2016 IEEE Symposium on Security and Privacy. Piscataway, NJ:IEEE, 2016:839-858. NAKAMOTO S. Bitcoin:a peer-to-peer electronic cash system[EB/OL].[2016-11-20].http://www.infres.telecom-paristech.fr/people/urien/blockchain_urien_2017.pdf. SIMMONS C, ELLIS C, SHIVA S, et al. AVOIDIT:a cyber attack taxonomy[EB/OL]. [2016-11-20].http://www.teraits.com/pitagoras/marcio/segapp/CyberAttackTaxonomy_IEEE_Mag.pdf.